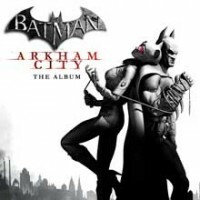 So, it’s with Batman: Arkham City that we finally get a follow up to the great soundtracks of the past. And it lives up to everything I could have hoped for. The eclectic soundtrack showcases brand new music from Panic! At The Disco, Coheed and Cambria, The Duke Spirit, Black Rebel Motorcycle Club, Blaqk Audio, Raveonettes, (Crosses), The Damned Things, Daughtry, The Boxer Rebellion, Serj Tankian, and the special edition exclusive A Place To Bury Strangers. And, as weird as it is to believe, all of the songs work extremely well together. It doesn’t feel off to go from the classic metal sound of The Damned Things and then go right into a song from the pop/rock group Daughtry. And from what I can tell, the reason it works so well is the content. And the content is that all of the songs are either about, or tied closely with Batman. And that’s awesome. In Panic! At The Disco’s “Mercenary,” a sample is used in the song that has someone (I’m assuming it’s Dr. Hugo Strange) analyzing Bruce Wayne and his parents’ death, and the sample is used perfectly as a bridge between vocals that’s incredibly effective to give the song an eerie feel that sets up the rest of the soundtrack, and from what I can tell, the game as well. The second track on the album is from my favorite band of all time, Coheed and Cambria. The song is titled “Deranged” and is about the relationship between The Joker and The Batman, and it’s written from the viewpoint of The Dark Knight’s most dangerous adversary. Singer and lyricist Claudio Sanchez is no stranger to telling stories with his lyrics as the majority of Coheed and Cambria’s songs are told in an overarching story called The Amory Wars, which also happens to be a popular series of comic books that the singer also writes. As a lifelong comic book fan, Sanchez also is no stranger to Batman and The Joker, so I’m sure it was a thrill for him to have this opportunity to tell a story with two of the most popular comic book characters of all time, because it certainly was a treat for me to hear. I seriously love the Hell out of this song, and I’d like to hear more of Sanchez’s take on this world. Those are my two favorite songs on the album, but every single track is a strong showing from each artist, including the next track, The Duke Spirit’s “Creature.” I had never heard a song from this group prior, but now I’d say that they’ve won me over. It’s really hard to critique this album because I’ve listened to the album several times, and while each artist has a different style, it seems like all were picked perfectly. There is an overall sense of darkness and dissonance that fits perfectly with the fact that this is a Batman soundtrack. There’s nothing bright or poppy from anyone including the pop rock group Daughtry. Singer Chris Daughtry brings a darker tone to his music here because he is one of the biggest Batman fans on the planet and he gives the character the proper respect, which all of the artists do. Sure, not everyone is going to love this because musical tastes are subjective, and I like certain songs more than others, but it’s a pretty safe bet for any rock or Batman fan. So, if you like some of the artists on here, don’t just buy their song on iTunes, pick up the whole soundtrack, because I think you’ll be pleased. The soundtrack is available now on CD and MP3, but a digital copy will be released inside the collector’s edition of the video game, which will be released on October 18. A standard edition of the game will also be released for Xbox 360, Playstation 3, and PC.